Printed on both sides of a 15 x 135 cm strip of paper, concertina-folded to make 30pp., with each page on a 15 x 9 cm panel. A scarce survival, on aged and worn paper. No illustrations, but detailed entries in small print. One side carries 10pp of 'Cavalry and Artillery Recruits' Physical Training Tables', 4pp of 'Trained Solders' Physical Exercise Tables' and the title. [ Pamphlet ] The Central Institute for Physical Education Warsaw - Poland. GUIDE. Illustrated with photos, in Eng;lish, 34pp., cr. 8vo, pictorial brown paper warsp, sl. chipped, mainly good condition. Label of Board of Education Reference Library(removeable) on back wrap. Stamp of same on titlepage (one inch diameter, round). Only one other copy found on COPAC and WorldCat, National Library of Poland. The first item ('Table Card'): 'G.S.T. | 15'. At foot of last page: 'SGPI - 155 CGS - 30-8-18 - 10,000' [i.e. dated 30 August 1918]. The second item without place or date. ONE ('Table Card'): 6pp., on three 22 x 9.5 cm leaves. In good condition, on aged paper, with small punch hole at top inner corner. Intended for officers directing physical training, and consisting of four tables (one to a page), numbered I to IV, with 'Notes on Physical Training' on the last page. Each of the first three tables is divided into 'Introductory Exercises', 'General Exercises' and 'Final Exercises'. Table IV is headed 'PRELIMINARY BOMBING EXERCISE. Special Report Series, No. 84. 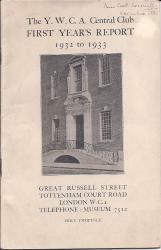 London: Published by His Majesty's Stationery Office. 1924. 48 + pp., 8vo. Stapled. In green printed wraps. In fair condition, lightly aged and worn. Divided into ten chapters, including 'Royal Air Force Tests used in the Present Investigation' and 'Types of Respiration, and the Respiratory Apparatus in Men and Women'. An interesting document: the Royal Air Force only having been in existence for six years. With stamp, shelfmark and label of the Board of Education Reference Library. Four copies on COPAC, and uncommon. Autograph Letter Signed ('S Smiles') from Samuel Smiles, author of 'Self-Help', to John T. Bacon of Blackburn , concerning a photograph of him by S. A. Walker of Regent Street, and his book 'Physical Education'. On letterhead of 8 Pembroke Gardens, Kensington W. 18 July 1882. [Printed pamphlet.] The Y.W.C.A. Central Club. First Year's Report. 1932 to 1933. ['Central Club. 3rd June, 1933.'] Great Russell Street, Tottenham Court Road, London, W.C.1. 12mo, 24 pp. Stapled. In original printed wraps. Text clear and complete. Fair, on aged paper, in dusty and worn wraps. At head of front wrap: 'Miss Scott Moncrieff. Executive Cttee'. The report is preceded by a list of officers, and followed by a list of 'Donors and Subscribers (From May 24th, 1924, to May 24th, 1933)'. Photograph of entrance of building on front wrap, and of whole of building on back wrap. Autograph Signature ('John P Gassiot') of the electrician John Peter Gassiot, FRS, on part of letter to J. C. Webster. 28 February 1857; on letterhead of 77 Mark Lane, E.C. On piece of paper cut from letter, 4.5 x 10.5. With both sides lightly-sprinkled with ink dots. Reads 'Believe me | Yours | John P Gassiot'. Reverse, with printed letterhead, gives the beginning of the letter: 'Sir | I was informed Yday Evg. that <...>'. Docketed by Webster 'Sent List | 28/2/57'. From Webster's autograph collection. Typed Note Signed ('Robert Woods') to Noon. 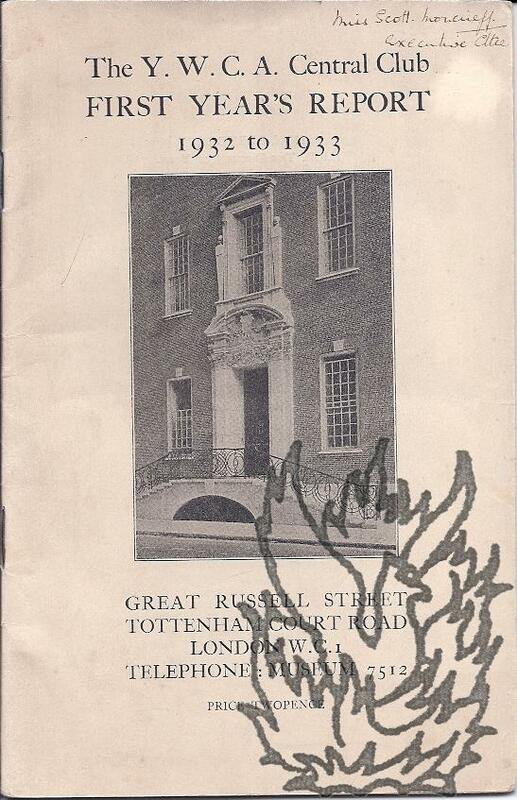 2 July 1942; with his Wimpole Street stamp. Autograph Letter Signed to Gladstone. 19 May 1902; on letterhead of the Victoria Institute, 8 Adelphi Terrace, London W.C.
12mo, 3 pp. Very good on lightly aged paper. Asking whether Gladstone would consent to the placing of his name on the list of the Institute's Council, 'to fill one of the vacancies'. 'You would be of great service to us in so doing - and the calls on your time would not be numerous - about a dozen times a year'. Six lines in shorthand (by Gladstone?) on the reverse of the second leaf of the bifolium. Paper entitled 'Refraction-equivalents of organic compounds'. English physical chemist (1827-1902), fellow of the Royal Society and father-in-law of the first Labour Prime Minister, Ramsay MacDonald. Nineteen pages, octavo (paginated 241-59). Unbound. Stitched. Good, though dogeared in one corner and on paper discoloured with age. In worn discoloured, grubby wraps. INSCRIBED at head of first page 'With J H Gladstone's kind regds.' Front wrap stamped 'SOTHERAN. SACKVILLE STREET. LONDON'. Paper entitled 'Specific Refraction and Dispersion of Isomeric Bodies'. English physical chemist (1827-1902), fellow of the Royal Society and father-in-law of the first Labour Prime Minister, Ramsay MacDonald. Seven pages, octavo (paginated 54-60). INSCRIBED at head of first page 'With J H Gladstone's kind regds.' Unbound. Stitched. Creased and with foxing at head of leaves. In grubby, creased wraps, stamped 'SOTHERAN. SACKVILLE STREET. LONDON'. Paper entitled 'The optical and chemical properties of caoutchouc'. Paper entitled 'The Relation between the Refraction of the Elements and their Chemical Equivalents'. Offprint 'From the PROCEEDINGS OF THE ROYAL SOCIETY, Vol. 60' . English physical chemist (1827-1902), fellow of the Royal Society and father-in-law of the first Labour Prime Minister, Ramsay MacDonald. Seven pages, octavo (paginated 140-146). Unbound. Stitched. In original grey printed wraps. With dogeared, worn corners (one missing) and on paper discoloured with age. Wraps worn and grubby and with slight loss at bottom. INSCRIBED on front wrap 'With J H Gladstone's kind regds'. Front wrap stamped 'SOTHERAN. SACKVILLE STREET. LONDON'. English physical chemist (1827-1902), fellow of the Royal Society and father-in-law of the first Labour Prime Minister, Ramsay MacDonald. Seven pages, octavo (paginated 140-146). Unbound. Stitched. In original grey printed wraps. Good on paper discoloured with age and with slight foxing to top of leaves. Wraps worn and grubby and with slight loss and closed tear. INSCRIBED on front wrap 'With J H Gladstone's kind regds'. Front wrap stamped 'SOTHERAN. SACKVILLE STREET. LONDON'. Autograph Letter Signed to Sir H[enry]. T[rueman]. Wood, Secretary, Royal Society of Arts. 9 February 1916; The National Physical Laboratory, Teddington (on deleted letterhead of the National Liberal Club). Inventor and engineer (1870-1923), whose papers are held by the Royal Society. During the war Harker was in the Inventions Department of the Ministry of Munitions. One page, 12mo. Good, if slightly grubby. Docketed in pencil and bearing the Society's stamp. Reads 'I send herewith a short contribution to the discussion of Dr Flemings paper at which I was present but in which on account of lack of time I did not feel it desirable to take part verbally.' Signed 'J. A. Harker'. 7 July 1947; on letterhead 34 West Hill Avenue, Epsom, Surrey. English chemist (1892-1950), Professor of Physical Chemistry, Birkbeck College, London, 1932–1937, and Professor of Chemistry, University College London, 1937–1950. One page, 12mo. Good, but with pin holes to top left-hand corner. Stamped as answered 8 July. He accepts the invitation to become a Fellow of the Society and encloses a cheque and application form (neither present). Signed 'S. Sugden'. Together with a carbon of the Secretary's invitation, dated 8 July 1947.